Today is a really good day. I didn't have to go to work. The husband and I get to spend a weekend to celebrate our 4 year anniversary (which was May 1st.) And finally, TheBoy is over at his grandparents for the weekend. I'm a little sad though. Last week my husband told me how he was going to miss TheBoy. I told him that he was right to miss him, but we had to have this weekend to ourselves. We deserve that much. Of course he agreed. So there we were today about to leave him with the grandparents when he starts being difficult. "I don't want to spend two days!" All we could do was reassure him that it would be okay. (He has severe abandonment issues from his birth mom.) As I was headed to the car I heard him give one more scream. I looked up at his dad and said "you'd think they were beating him." That's when he said it. "He's crying." What! How... are you sure... *sigh* And that was it. I couldn't take it. I just wanted to cry myself cause I didn't want to leave him there all unhappy. I know that he is safe. I know he is just overreacting. But I felt like such a bad parent! I feel so guilty for leaving him there. AHHHHH!!! The humanity! Ok, so on to more fibery pursuits. 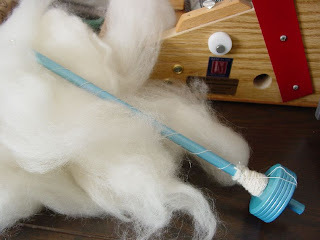 I pulled out one of my handmade spindles and started playing with some of the fiber from the Sheep Shed Studio. I am currently spinning it naturally with the hopes of plying it and dying it. It's terribly tiny. 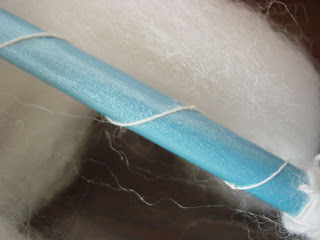 Also, it reminds me of how really really tedious I found spinning on a spindle to be. Funny thing is, I find that I spin much finer yarn on the spindle then I can on the wheel. While it could be a number of things. I believe part of it is the equipment. My wheel is a Babe Double Treadle Production. Since purchasing it I have had a chance to spend on several different wheels via my spinning group. Now, I am less in love with it then I should be. My dream wheel is the Kromski Sonata and my hopes are that the stimulus money is good to me. Probably won't be from the reports but every little bit counts. In the mean time, I am making the best of every situation. I have been talking about doing new things with the spindle selection in my Etsy Store. I totally want to buy a lathe! That's probably a dream a long time in the making but its come up once or twice before in brainstorming sessions with my husband. (I call these talking sessions, cause most of the time I'm just talking in all kinds of directions and my husband is thinking about other things. ) Until then, I think I will keep trucking. I have a "refurbished" felted scarf that I am working on and I've already reserved a spot for making fiber wearables on Etsy. My mind is just going with these ideas and I am so trying to keep up! But really, I am having so much fun doing it. Happy Fiber Friday all!